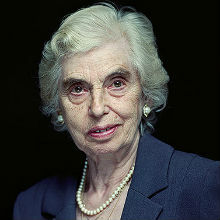 Renee was born Rywka Ruchla Berkowitz in Zduńska Wola, Poland, in 1929. She lived with her parents and younger sister, and had many aunts and uncles. After the invasion and occupation of Poland in September 1939, German officers decided that they liked the family’s flat, so, as happened to many Polish families, Renee and her family were thrown out with no possessions. They had to split up between aunts and uncles, and Renee was sent to live with her grandparents in Kalisz. Soon after arriving there, the Nazis decided to make the town Judenrein, or 'free of Jews', dividing up the Jewish inhabitants between other towns. Renee’s mother heard about what was happening, and was able to take Renee and her grandparents back to Zduńska Wola. A ghetto was soon established in Zduńska Wola. Renee and seven other members of her family lived in one room in the ghetto, and Renee worked in a factory making socks for the army. In 1942, everyone in the ghetto was told to assemble, as they were being moved. Believing that they would soon return, the family hid Renee’s grandparents and four-year-old cousin in the attic. This was the last time that they saw them. Those people who had assembled were told to hand over all children under the age of 18. Renee’s mother tried to hide her and her sister under a coat but her sister was found and taken with all of the other children. By luck, Renee managed to go unnoticed and was able to go with her mother and father on the transport to the Łódź Ghetto where her paternal grandparents were already living. In 1944 the people in the ghetto were told that it would soon be cleared and that they should assemble at the train station. Renee and her parents volunteered to go, and were taken by train to Auschwitz-Birkenau, where Renee managed to survive another selection. Renee and her mother were then transported to the harbour in Hamburg, in Germany, to a warehouse in the docks where Renee worked on demolition. In March 1945, Renee and her mother were once again moved, this time to Bergen-Belsen. During the journey, Renee was separated from her mother, but managed to find her again in the camp. Renee and her mother were liberated from Bergen-Belsen on 15th April 1945 by the British Army but Renee’s mother died in hospital 12 days after the liberation. After the Holocaust, Renee retuned to her hometown to try and find any surviving members of her family and found an aunt who was living in Łódź, who she moved in with. At the end of 1945, Renee’s aunt married and they moved to Germany. From there they moved to Paris, where Renee met Charles who was with the British Army. They married in 1949 and had two children. Renee lives in north London and has 5 grandchildren. Renee regularly speaks in schools about her experiences during the Holocaust. Renee’s story can also be found in Survival: Holocaust Survivors tell their Story, published by the Holocaust Centre, and in the BBC documentary Grandchild of the Holocaust.